For my son's birthday/baptism dessert table, I made some rainbow Jell-o Shots...NO...there was no alcohol:) The kids LOVED these and they were one of the first things gone! I got the plastic shot glasses at a restaurant supply store and I also got some cute mini spoons to go with them. Perfect size for kids!! I found the recipe on the Do Better Blog. 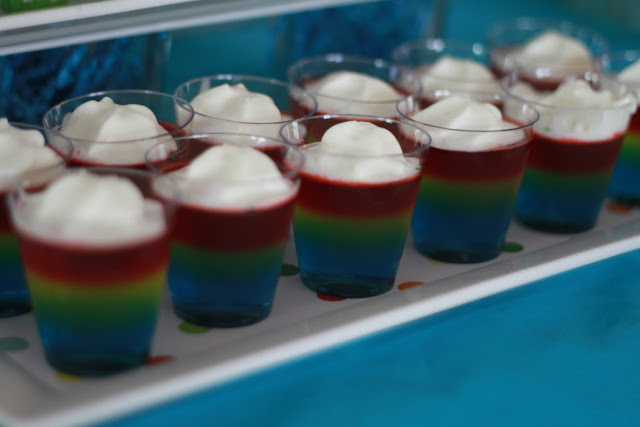 This recipe is so awesome because it looks like you used Red, Orange, Yellow, Green and Blue jell-0, but I only used Red, Yellow and blue. Trick of the eye:) Here is the recipe!! Enjoy! Start with the blue jell-o and mix a packet of know gelatin...mix the powders together. Pour in 2 cups of boiling water. Dissolve the gelatin. Add 1/2 cup of ice. Stir until thick. Remove any bubbles that have formed. Pour into a 9 x 13" pan or put into the shot glasses. Let set in the refrigerator. Repeat with the Yellow Jell-o and then do the Red Jell-o. You can top it with some Whipped Cream as well. Just don't take a short cut and use that Redi-Whip stuff...It totally melts!